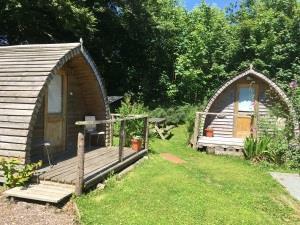 Tunnel Pods01297 560049work Camping ParkSet in a field surrounded by stunning countryside, the pods are contemporary wooden cabins providing cosy accommodation for two or four people. The site offers five pods - two Standard Pods sleeping two and three Family Pods sleeping up to four. The Family Pods have their own private toilet and wash basin while the Standard Pods enjoy use of the toilets in the shower block. Set in a field surrounded by stunning countryside, the pods are contemporary wooden cabins providing cosy accommodation for two or four people. All of the pods are hand crafted and fully insulated (with a double glazed window at one end) and come with electrical hook up points. Each pod has its own decked seating area and easy access to the toilet and shower block and sheltered cooking area. Heated shower block, flush toilets with lighting, hot water and electrical hook up.